Whether you’re a student, business or just looking to free up some space at home, we want you to think of us as the ‘spare room on your doorstep’. We’re flexible, friendly and once you’ve booked your space there’s no need to notify us when you want to access your stuff. Just pop along during our long opening hours and you can let yourself into your unit. 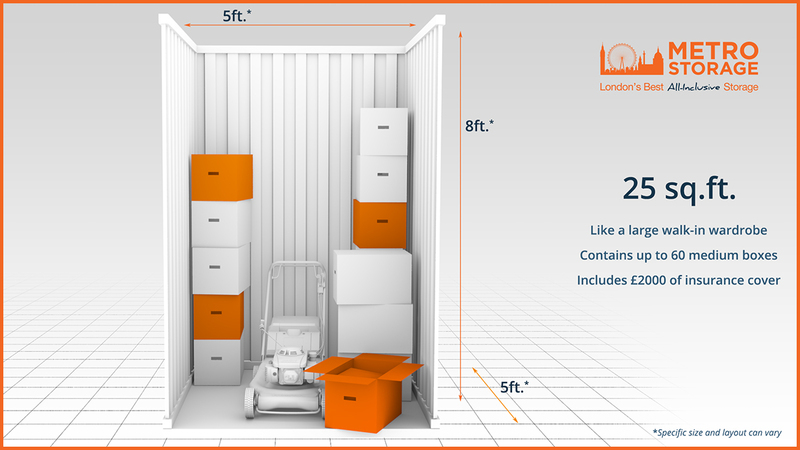 Our London storage costs are always kept affordable. If you’ve got any more questions just email us or give us a call on 0800 999 5881 and our helpful storage experts will be happy to discuss your needs and advise you of the best solution for your self-storage. 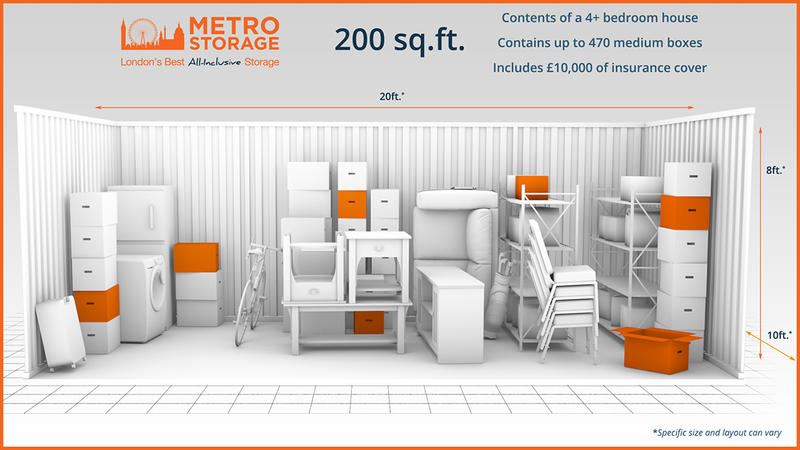 We have a range of storage unit sizes for your needs. 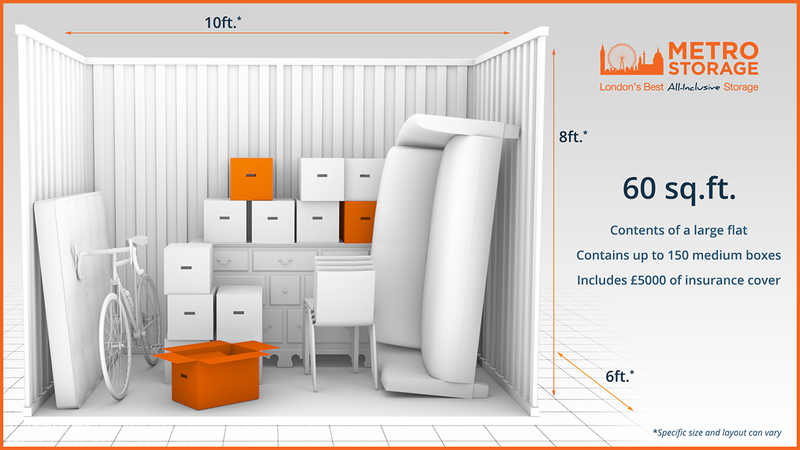 What Size Storage Unit Do You Really Need? 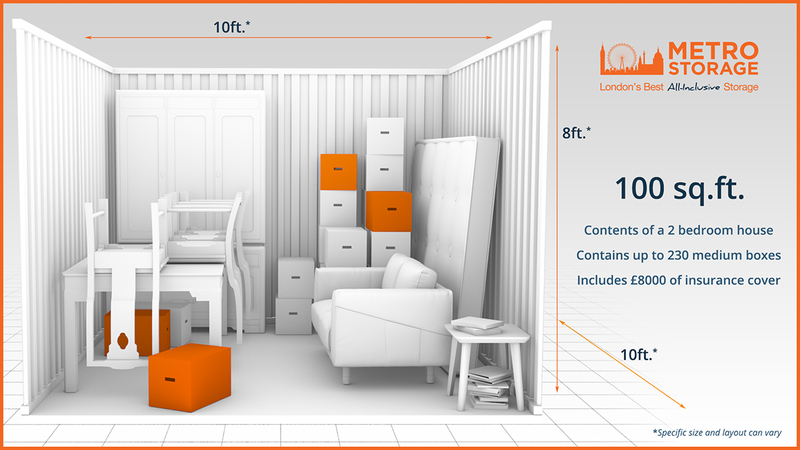 Whether you’re packing up your home for a year abroad or looking for some extra business storage space, it can be hard to visualise just how much space you really need. Go too small and you risk not being able to fit it all in. Go too big and you’re wasting money on space you don’t need. But there’s no need to get overwhelmed. 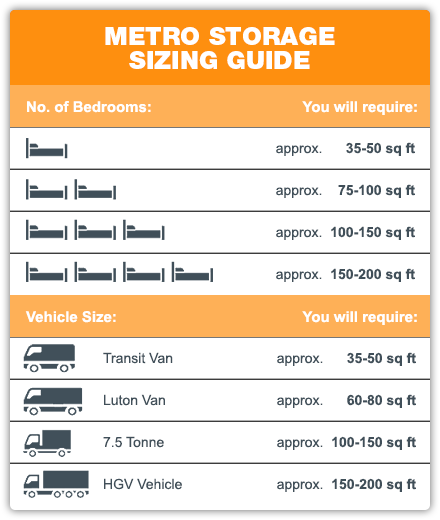 Our handy storage size guide below will help you to get a rough idea of how much you can fit into each unit size, helping you better choose the right storage unit for you. 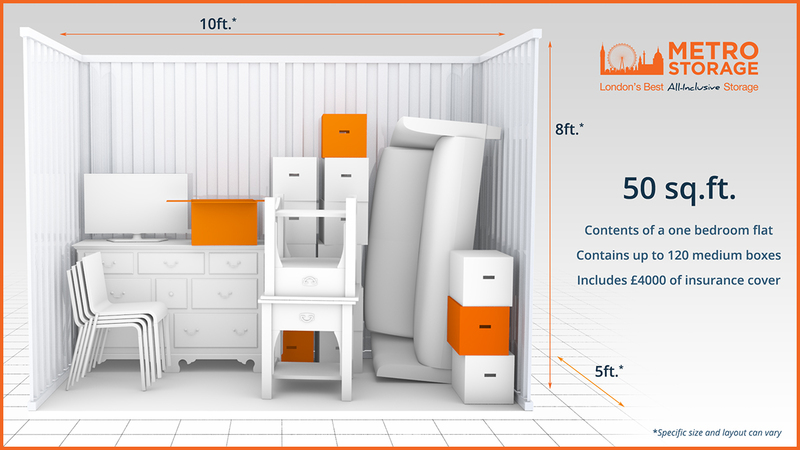 All sizes are approximate and your needs will vary depending on how you pack your items and how much access you require to things stored within the unit. Don’t worry too much about getting your unit size exactly right. 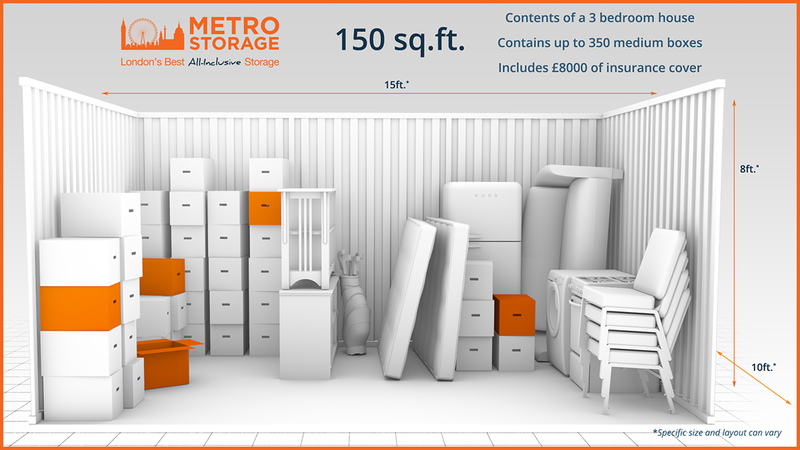 Here at Metro Storage we understand that sometimes your needs change and you need to store more or less. That’s why we make it easy to upgrade or downgrade your unit whenever it suits you. Just give us a call, drop us an email or pop in to speak to us. 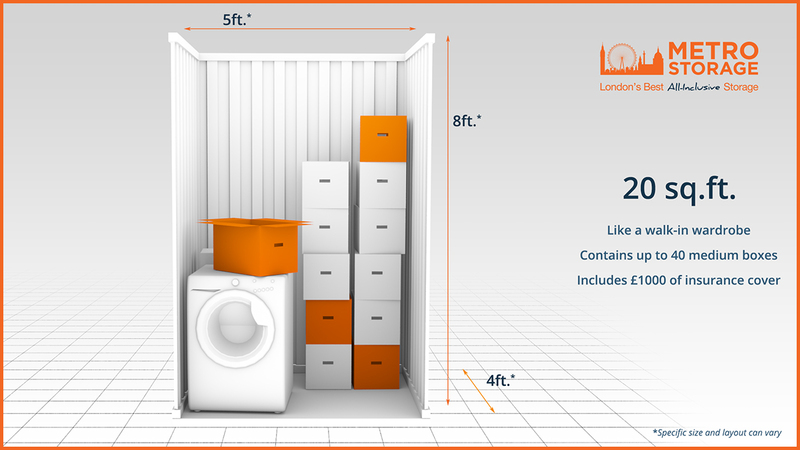 One of our friendly team members will be happy to talk through your needs and show you the unit sizes we have available for you to choose from. Our Easy Move Bundles Can Make Moving Day Simple. With everything you need, from packing and boxes to a man and van, our Easy Move Bundles can help moving in to your unit hassle free. 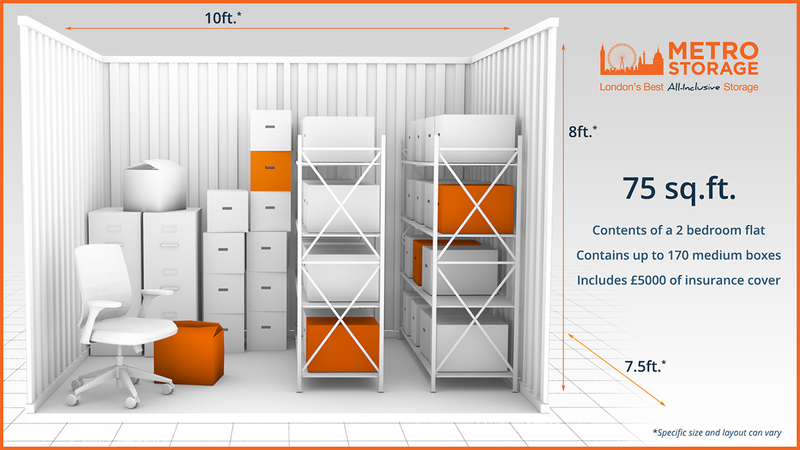 If you’re looking for a high quality storage solution on your doorstep in Central London, then you’re in the right place. As members of the Self Storage Association UK you can be sure that you’re in good hands. We pride ourselves on the level service we provide our customers with and are proud to adhere to the strict standards The Self Storage Association require. Giving you great storage and complete peace of mind.